Take a closer look at this video below. EPSON BrightLink Interactive Projectors un-tether teachers and make it seamless to move from computer, to document camera, to DVD, to simple on-board annotation and back again. That makes class time prime time for learning. Today I have Karen Smith as guest blogger. Please be sure to check out her unique guest post. 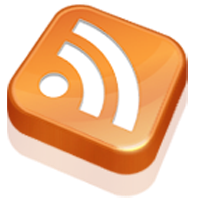 Guest posts are always welcome, please contact me. While the world of online education has been booming for the past few years, it’s important for us to remember that there are still people who have yet to venture into this vast world of virtual learning. I'm not saying it's not easy to get wrapped up in all of the new-fangled, technological advances available to virtual students, we just needn't forget those who are still new to the whole thing. Each semester more and more give it a try, if for no other reason than to see what all of the fuss is about. So, for those of you preparing to embark on this path for the first time, I thought I'd offer a few tips, tricks and things to consider to make the experience a positive one. This might seem like such a simple, obvious step that it shouldn't be listed, but I think it's important enough to be first. After all, the syllabus is the foundation of any course. So, as soon as it's released, I recommend printing out a hard copy and posting it somewhere near where you plan to do most of your work. This way, you will always have it within arm's reach for quick reference should you need it. Plus, you never know when the class's system might randomly go down, so having a copy easily accessibly can really come in handy and possibly even save your grade! Or as regular as your current priorities will allow. 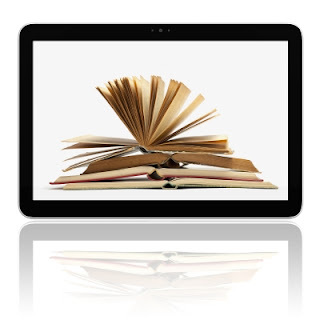 Part of the beauty in online learning is the flexibility it allows. Depending on your course, you may have specific times you HAVE to be online and participating, but for the most part you are allowed to come and go as you please. But be aware, don't take this as an opportunity to let your procrastination take over. Having the leisure to make your own schedule and deadlines makes it a bit tempting to put stuff off, but this isn't advised unless completely necessary. You want to stay on top of assignments almost more so than in an ordinary face-to-face course because you never know when technology will turn against you and delay the chance you have to turn in an assignment. Speaking of technology backfiring, you need to prepare for that happening to you at the worst possible time. The one drawback to online learning is during crucial times like test taking or project submission, you are at the mercy of your machines. So, should the unthinkable happen and you lose your connection, or data or whatever the technical emergency you'll want to instantly contact either your professor, the technical support line or both. If you have their numbers written down somewhere nearby, you will speed up the process, especially if the issue is that your machine is unresponsive and you now can’t look up their information even if you wanted to. If you happen to know someone else in the course, you should write their number down too, just in case. Although it might be easy to forget given the method of teaching, this is still a class with other humans, so if you have a problem sometimes a phone call is the best solution. Overall, if you are taking your first online class, just approach it like you would any new course. Sure the methods of interacting and communicating might be a bit different than more traditional courses, but the goal of learning remains the same. Just give it your all and you're guaranteed to be fine. Karen Smith, a former newspaper reporter and globe trotter, now freelances for various publications and websites. She hopes to bring her readers the latest in business education at onlinebusinessdegree.org, as well as up-to-date, informed advice on everything from careers to parenting to health and more. Karen welcomes your comments below! According to a recent QLM survey, organisations pay nearly 10 times more per attendee for in-person events than for online training. "Virtual events for training purposes are becoming the standard way of delivering training of all types." 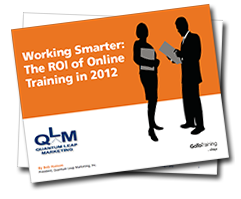 This Quantum Leap Marketing brief explores this key finding and more, drawing out the 6 best practices for increasing your online training ROI. Contemporary debates in criminal justice, the impact of rhythms and music among different cultures, and democracy in America are among the diverse classes offered by the Osher Lifelong Learning Institute at Vanderbilt this fall. Other courses will focus on social media and digital technology, the Big Apple from 1870 to 1910, the Book of Psalms, German Expressionism and recent medical advances from doctor and patient perspectives. Meet the faculty and learn more about the Osher classes at the fall kickoff Sept. 4 from 5 to 7 p.m. at Vanderbilt’s Central Library. A cocktail reception on Library Lawn will follow the program. The cost is $20 per person. 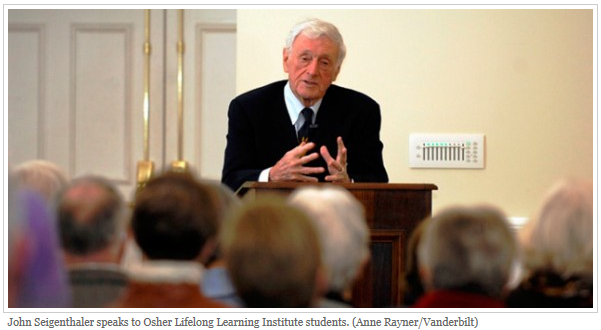 For the first time, online registration is now available for Vanderbilt’s Osher Lifelong Learning courses. The non-credit classes are open to all adults 50 and older who want to pursue lifelong learning through lectures and discussions in a relaxed, supportive environment. Deadline for fall registration is Sept. 14. To sign up for classes and/or the fall kick-off, visit www.vanderbilt.edu/olli. Massive open online courses (MOOCs), which are internet-based classes available to the global public, have received a great amount of publicity in recent months, and with good reason. These online educational services have garnered millions of followers, as well as donations and venture capitalist funding in some cases. They have also begun to reshape the models of both online and in-person education through their ability to build a worldwide community of web-based learners. 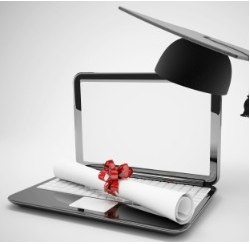 Examples of MOOC providers include companies such as Coursera and Udacity, as well as online universities like the University of the People. Coursera offers free classes from campus-based institutions such as Stanford, Princeton, Penn, and Johns Hopkins. The University of the People is an institution whose aim is to be “the world’s first tuition-free university dedicated to the democratization of higher education.” These and other MOOC-providing organizations are having a profound impact on how both students and educators approach the methods and accessibility of higher education. Smithsonian.com reports that Coursera is shifting the online course model from a standard lecture series to a more interactive experience for students. Instead of providing traditional, uninterrupted videos of professors’ lectures, Coursera has broken up these lectures into 10-minute segments, and requires its students to pass a quiz before moving on to the next section. 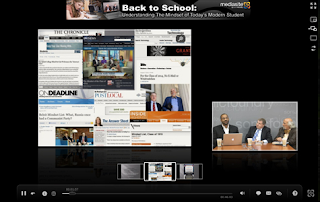 Internet-based classes also enable educators to gather valuable information about students’ learning styles and practices. For example, MOOC professors can now see what sections of their lecture students had to rewind most frequently, as well as quiz questions that were commonly answered incorrectly, in order to make corresponding improvements in their lectures and course materials. On Monday, avVenta Worldwide got on the horn to toot its own horn (and rightfully so) over the company’s success in helping launch a hugely popular mobile app with National Geographic. 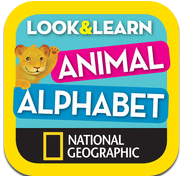 AvBenta’s iOS mobile application Look & Learn: Animal Alphabet was made in collaboration with National Geographic. “Within hours of its launch the mobile application shot up the ratings and made the iTunes App Store’s top 10 Top Paid Apps list and was selected as a featured app by Apple,” avVenta says. The mobile application takes learning the alphabet to a new level by using digital media to help advance education of children at an early age. Founded in 2005, avVenta Worldwide is a privately held, digital marketing production partner, headquartered in New York City with offices in Charleston, Los Angeles and a production "center of excellence" in San Jose, Costa Rica. The company specializes in Digital Production, Marketing Operations and Platform Support for over 130 of the world's leading brands. Today, avVenta provides services to a host of Fortune 500 clients, including the top pharmaceutical companies, major technology leaders, and leading travel brands. For more information, please visit www.avventa.com. 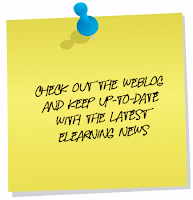 Blackboard Learn implementation hinders learning? We’re all a week in now. Students should be starting to get back into the swing of things around PUC. And perhaps they are. However, this semester brought a few new and not quite well-communicated items to the table. The transition from Blackboard Vista to Blackboard Learn is in progress.“Blackboard makes the mobile move” by Richard Chambers. Most students probably didn’t think much of this before classes started, and overall it is a positive move for the campus. The new Learn platform is much more modern looking and so far seems to have generally user-friendly functions, without mentioning the mobile application which has been a much-needed addition. The problem with the whole thing is that communication has been lacking in the department of training for students on Learn. Perhaps the thought was that students may be more technologically savvy than instructors, who did receive training. Either way, some students could not even find their classes on Blackboard because of the mixture of classes using Vista or Learn. The Learn login link is buried within PUC’s website, as well. 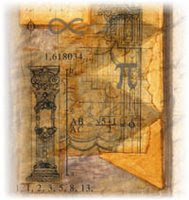 By the way, to find it, go to mycourses.purduecal.edu. Students are not completely innocent on this issue; there has been some information given out by professors of specific classes that are using Learn. Also, it is possible to find Learn’s tutorial videos at webs.purduecal.edu/oit/learn/support-tools. Most students were not informed of these tools, though. Hopefully, there will be some kind of communication about this issue soon. It just seems a little late in the game. Check out this Upcoming free Webinar. It happens every year. You face a lecture hall full of college freshmen and feel how cavernous the generation gap has become. To you Amazon is a river in South America; to them it’s an online shopping giant. You understand what ‘don’t touch that dial’ means; they’ve always had a remote control. You wanted to be like Mike; their NBA heroes are Kobe and LeBron. Ever wish you could get inside their minds to really understand where they’re coming from? Here’s your chance. On Tuesday, August 28 at 1 p.m. Central, you’ll have a rare opportunity for live Q&A with the authors of the Beloit Mindset List. Whether you’re in front of a classroom of college freshmen, or work behind the scenes on the facilities and technologies they’ll use on campus, we guarantee you’ll gain new insight of the next generation of students. And maybe even get a good chuckle in the process. Laura Devaney, Managing Editor writes, "A new community featuring expert tips, discussions, and frameworks aims to help school leaders and all stakeholders successfully navigate the digital education transition." ﻿The U.S. Department of Education, the Friday Institute for Educational Innovation at North Carolina State University, and the Consortium for School Networking (CoSN) partnered to create the online community of practice. Epic-ed aims to empower digital transitions at all stages of development, including school leaders who are thinking about moving to ubiquitous computing environments, those who wish to implement ed-tech pilot projects, and those who are ready for full-scale implementation. On the community’s website, users will see a depiction of the digital transition cycle, a framework that epic-ed uses to help stakeholders begin or evaluate their progress toward digital education. Vision: Helps leaders define goals, guiding principles, and reasons for the transition. This cycle features a Readiness Assessment and guiding questions that focus on identifying stakeholders and outlining goals and strategies. Plan: Guides stakeholders as they explore resources and helps leadership teams use data-driven decision-making. Users will find a Master Plan and Mapping Document to help them find resources and create detailed guidelines. Implement: Leadership teams have a chance to update their goals and progress as they move through implementation. The Implementation Plan helps leaders as they move toward deployment. Assess: In this phase, digital transition teams evaluate which policies, assessments, and technologies are right for their particular initiative. A Technology Integration Tool and a School Technology Needs Assessment offer guidance. 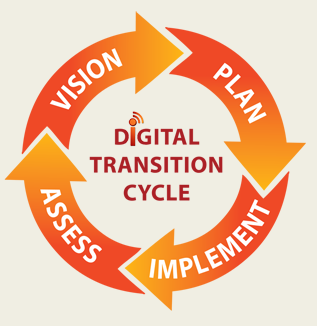 Each section is accompanied by a video and numerous web resources to support each phase of the digital transition cycle. Cara Townsend writes, "Morristown, Harding schools embrace iPads for their classrooms. All seventh-grade students in the Morris School District will be issued iPads this year as will all students in grades five through eight in the Harding School District." When Morristown High School introduced a limited number of iPads into the classrooms of the Classics Academy last year, the tablet became a research tool and a way for students to continue discussions outside of class. Over the past four years, the district has rolled out “technology infusions” for different age groups of students through the district’s operating budget, school district Business Administrator Christine Kelly said. In science class, students can watch virtual dissections and in social studies can take a world tour on Google Earth. Every classroom will also receive an Apple TV box. Superintendent of schools Alex Anemone says the funding came from a $100,000 grant from the Parent-Teacher Organization. Each classroom is also equipped with SMART Boards. For the past year, administrators, parents and teachers have been involved in the planning of the One-to-One iPad initiative. Career tip: Is a part-time MBA worth your money and time? Five years ago, Neeraj Arya, now a deputy manager with a telecom company, enrolled for a short duration, distance learning management programme being conducted by arguably the most prestigious business school in the country, the Indian Institute of Management, Ahmedabad (IIM-A). He had hoped it would open up new career options for him. But after attending a few interviews once he had completed the course, he realised to his shock that it would do no such thing. "As soon as my interviewers heard I had done a distance learning course and not the regular postgraduate programme, they were no longer interested," he says. Thousands of young people who are already employed, but who, for various reasons, missed out on traditional management education, take such part-time courses - often conducted long distance, using satellite - hoping to improve their career prospects. Though IIM-A has stopped them, many other leading management schools such as IIM, Bangalore and Lucknow, XLRI, Jamshedpur, and Indian Institute of Foreign Trade, Delhi, persist with these courses. Why are employers unimpressed? It is primarily because, unlike in a regular MBA course, where the selection process is rigorous, almost anyone who wants to - and pays the fee - can enrol for part time courses. 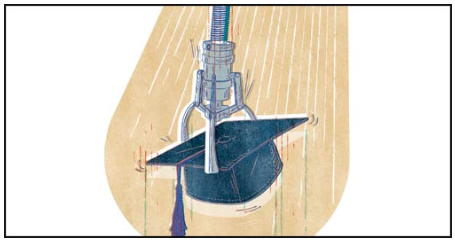 "There is a lot of competition to get into the MBA programmes offered by reputed schools. This is not perceived to be the case with executive MBA courses," says Ruchi Bajpai, senior HR consultant with Elixir Consulting, a recruitment and search firm. New VmathLive is finally here!